12 colorful, double-sided Bingo game boards /(8 1//2" x 11"/) - 24 playing surfaces in all! 12 full-color, laminated /(8 1//2" x 11"/) Artic Bingo boards printed front and back! This gives you 6 initial, medial, final, and combo boards for K /(24 playing surfaces in all/). 24 colorful pictures on each board. 96 riddle calling cards /(2 1//8" x 3 5//8"/). The caller can choose to read the riddle and have kids guess the answer or show the target picture and say the word. Bingo chips /(assorted colors/) in a handy storage tub. Bingo boards and calling cards—color-coded for easy sorting—green /(initial/), red /(medial/), purple /(final/), and blue /(combo/). 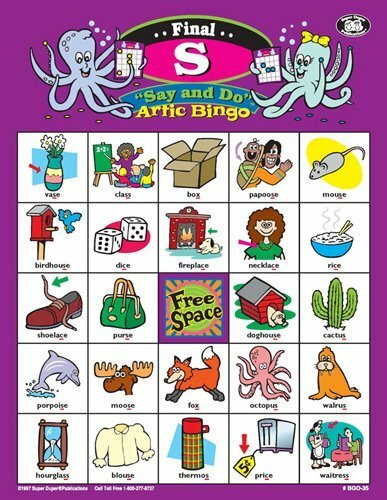 Order your Say and Do S Artic Bingo today and get ready for the compliments. "Cool," "Awesome," "Groovy." 2 to 6 players. Great for all ages!